For over a decade, cable subscribers have had to deal with a program guide that failed to provide quick access to the channels they wanted. Cablevision (s CVC) is trying to change that, releasing a new feature aimed at curing a major headache for pay TV subscribers: navigating the morass of channels and programs available. The cable operator’s new feature, called iO TV Quick Views, enables subscribers to create personalized mosaics of content that will allow them to see, at a glance, what’s playing on up to nine different channels at once. It promises to give viewers more control to quickly scan and find the content they want, without having to flip through the typical channel guide. To access personal mosaics, viewers can tune to Channel 600 on the program guide and create up to 20 different Quick View mosaics, based on personal interests, favorites or groups of similar channels. The feature includes several sample pre-set mosaics that subscribers can edit, or they can make their own by choosing from 140 different channels to build mosaics in configurations of two, six or nine channels that can be viewed at once. In addition to seeing what’s on now, users also have access to future programming that can be added to their DVRs. Once they’ve found a program of interest, subscribers can simply choose a channel by hitting the Select button on their remote controls. 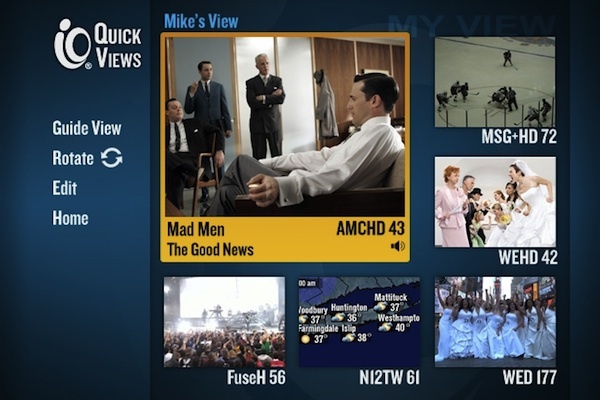 The release of Cablevision’s Quick Views comes as several pay TV providers are seeking to improve the user experience of browsing and navigating content through their program guides. While the pay TV grid has survived more than a decade as the de facto way to navigate cable content, growth in the number of channels and programs to choose from has rendered it all but useless for browsing and content discovery today. Other providers are also hard at work on this problem. Comcast, (s CMCSA) for instance, is testing a new and interactive program guide called Xcalibur that could improve search and discovery directly through the set-top box. Comcast and other providers are also seeking to solve the discovery problem by embracing the “second screen” and building mobile apps for iOS (s aapl) and Android (s goog) devices that can also act as remote controls. AT&T (s T) and Verizon (s VZ) are among the pay TV providers that enable subscribers to use touchscreen controls and mobile keypads to search for programming they want to watch, easing the pain of manually entering letters into program guide search boxes using a traditional remote control.